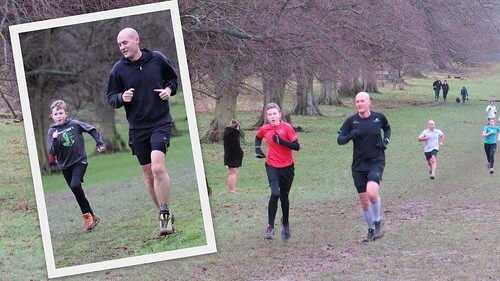 The New Year's parkrun with the possibility of a double with neighbouring runs, is always a great event and this one certainly didn’t disappoint. 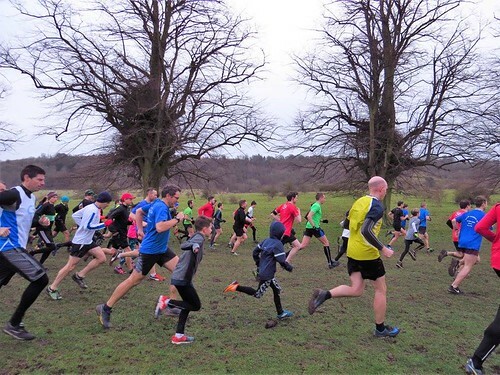 With the opportunity of a double, plus new resolutions, it always has the potential for a bumper crowd and so it turned out to be with 353 joining us for a run in Tring Park, our 2nd highest number ever. 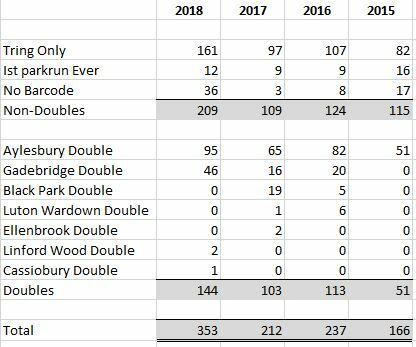 With so many runners I was hoping to start with a year related time but Peter Mackerall was 2 years too late with his time of 20:16 and Mark Herbert a year too early with his 20:19 however instead we will start with our congratulations to various milestone runners including juniors, Aidan Roberts and Emily Scott running their 10th parkruns and Louise Brookes, Richard Alcock and Lisa Sammons running their 100th parkruns (with all 3 having run their 99ths at either Aylesbury or Gadebridge just 90 minutes earlier). 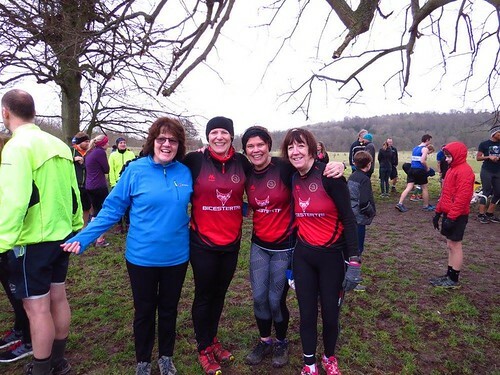 And keeping it in the family, well done to Louise's brother and Tring/Aylesbury regular Howard Lambert who ran his 50th at Aylesbury on the same day - so well done to all of you! 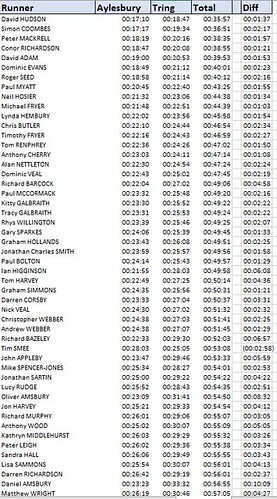 Lynda Hembury was our fastest female and recorded the highest age category % for the 55th time at Tring after also having been the fastest lady at Aylesbury. It’s the 3rd year in a row that our fastest female had already been the fastest female at Aylesbury, and each year has been a different female. 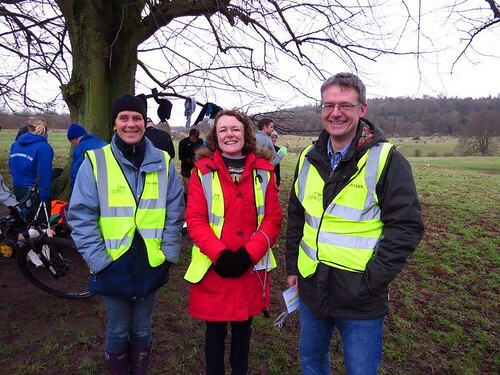 I'm Kevin Lynch and I've been parkrunning since September. I wanted to share my excitement with you and the community because today I achieved a PB of 44:05 on my 18th run. I had decided to do two parkruns today, because if you are going to do it why wouldn't you do double parkrun if you can. 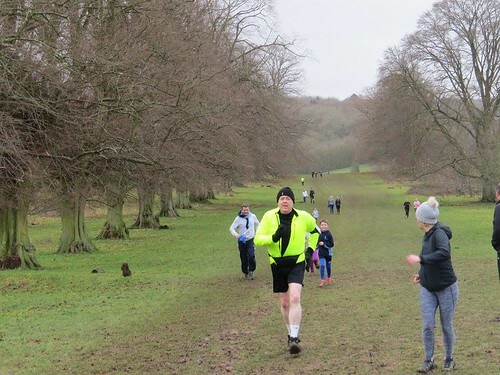 I'll be honest I was conflicted because there is something magical about parkrun in Tring Park - until today it's been the only parkrun I've run. I turned up at Gadebridge this morning at 08:45 for the briefing and caught a few sniggers in the briefing, when they asked for tourists, and I proudly shouted out "Tring." Unlike Tring which is a single lap the two laps at Gadebridge meant that after running for about 16 minutes I was being lapped by the front runners at 2km. I realised that because the course was relatively flat I had a possibility of a good time so I asked the tailwalker Andy Mitchell who had caught up with me on the last 1k to pace me in. He gave his bag of run markers and signs to a marshal and helped me run in. It was fantastic coming in the last 100m going full tilt and I had nothing left as I crossed the line. 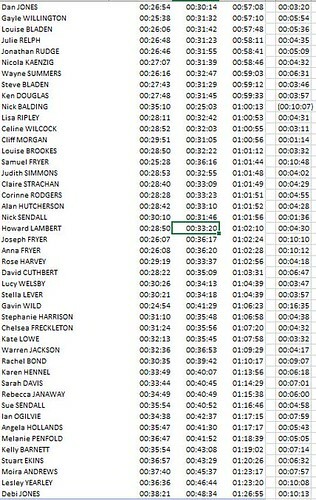 A good time for me of 44:44, 2 seconds slower than my PB. In Chinese culture the number 4 is considered unlucky and has the same sound as death so I'm thinking it's a good thing I'm not superstitious or I'd have asked for a slower time. 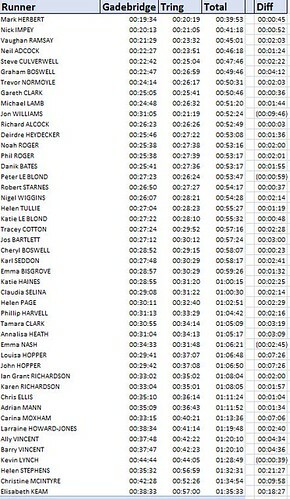 On looking at the results later I was not surprised that almost 95% of the runners had completed in under 37 minutes. My wife, and chauffeur for the morning, sped me along the A41 to Tring and I was on the line for the 10:30 start. The run director warned it's going to be slow as it's very muddy as you cross the treeline. I thought YES, because I ran a good time on Saturday in the mud. It slows the main pack down so much that I was able to pass some of the slower people and it's a rare pleasure for me to run in a group of people - normally I'm 2 minutes behind everyone else. One thing I've learned about running from talking to runners, non-runners, and former runners. There are always a million reasons NOT to run. Me, I've got low Haemoglobin, low vitamin D. Friends say they have worn out their knees, their hips and can't run. What I've learned is that you just have to run, if you are not well, just do it. You don't need to log an amazing time, you just need to run and keep running and one day when the stars align you hit a new PB. Thanks for that great write-up Kevin and yes the 36 no barcodes was a record in itself! If you’ve made it all the way through this week’s report – well done!